His advice to young people looking to land their first job in “media, technology, or related fields” can be summed up in three words: learn some programming. Generally, I think this advice makes sense. In fact, I find it odd that in this day and age it’s possible to graduate from high school (much less college) without having written some computer code. Assuming there are still some rigorous secondary educational programs out there — the kind where kids have to learn algebra and geometry and how to diagram sentences — a little basic computer programming would fit in nicely. Of course, if we’re really facing the shortage of technically literate employees that McDonald claims, we’re going to need more than that. Fortunately, technical education (as distinct from certification / credentials) has never been easier to come by. We recently looked at an app that lets kids create their own games. Teaching kids to build a business may sound exotic and cutting edge, but the truth is that our economy is rapidly changing, and nothing is evolving faster than the nature of employment. As I was just observing earlier today, encouraging technology startups may be the key to improving the employment picture. Or to put it in more stark terms, the only job that may be available in the future is the one that the student (graduate / job-seeker) creates for him- or herself. Unfortunately, the school didn’t appreciate such “disruptive” activity. We were (partially) shut down and left with a bitter aftertaste of the school system. The Incubator School is looking to create a different kind of environment, one where that kind of activity would be encouraged and, presumably, rewarded. Perusing their Digital Sandbox (I like that name), I observed that they are looking at gaming development systems, augmented reality, maker spaces — all the kinds of things we have been describing here as potential components of an overall shared creative space. So there may be an interesting convergence here. In the near future, all schools might need to emulate some aspects of Incubator School, if they are going to help students develop vital life skills around creating and managing their own opportunities. To be effective in helping kids develop these skills, providing shared creative spaces may be of paramount importance. The part that makes sense is helping students to understand that Google is not a source of information per se, and that it must never be cited as such. Students need to understand whether what they are looking for is a definition of a term, an overview of a topic such as might be found in an encyclopedia, or more in-depth information such as might be found in a book on the particular subject. When you type a search term into Google, it will bring back an unfiltered combination of those things. So what to do? Well, the obvious answer is to eschew Google. While on my Google tirade, I happened into a kindergarten class. In the midst of exploring dinosaurs, one little girl asked a question that the teacher didn’t know. “Let’s Google it,” the teacher suggested to the student. Unable to contain myself, I jumped in and showed the student how to access World Book Kids ­- which not only had information at a lower reading level, but also included text­-to­-speech. That’s great! But I can’t help but wonder — where would the harm have been if the kindergarten teacher had been allowed to go ahead and use Google and had entered a somewhat more refined search than just, say “dinosaurs,” something more along the lines of dinosaur information for kids. Of course, citing Google as a source makes no sense. It would be like citing the card catalog as a source. And kids need to understand the differences between the various sources of information they are accessing. Still, whatever those sources are — Google is a great way of getting to them…if you use it properly. Strategic use of search engines is an important life skill (much less educational or research skill) for kids these days. Do we really want to put artificial constraints around how they go about finding information so that things will be more like they were in years gone by? Search engines get us to the sources of information in a very different way than the research tools of the past. But this is as much a feature as it is a bug. Let’s work on a developing a new set of skills to make the best use of resources available. Google can be an extremely able research assistant if given the right instructions. A while back we took a look at Maker Camp, an online summer program that gives kids the chance to make their own toys, games, and other gadgets. Like augmented reality technology, maker activities provide a shared creative space for students to learn and interact while interacting with the real world…with the added benefit of actually making stuff! programs like the Maker Corps are working to integrate maker spaces into public school classrooms and after school programs. At the same time, libraries are getting in on the act and providing these kinds of spaces not only for students but for patrons of all ages. The idea behind the collaboration was two-fold; it would serve as a way to provide open, equal community access to tools and kits that might otherwise be out of reach, and it would offer libraries a way to upgrade their relevancy as a centerpoint for large-scale literacy, in a world where books are losing currency to emerging tech & new generations. The leaders of the Jefferson County libraries were extremely enthusiastic about the program, so we set out supplying Belmar – the first of four JeffCo libraries to adopt the makerspace-model pilot program – with SIKs and other kits, as well as training, to get them set up to offer the same tools and classes to the public. There are a lot activities that come to mind when we think of libraries: reading (obviously), studying, book clubs, other kinds of discussion groups — but how many of us think of soldering when we think of the local library? How many of us think about designing and building circuits? That’s now part of what kids are doing in the Belmar library. We can expect to see a lot more of that sort of thing both in libraries and in the classroom. More Fun to Cook than to Eat? A common (if pat) critique of video games is that they stifle rather than inspire creativity in children. Never mind that just the opposite might be true–that young gamers are often just as if not more creative than non-gamers. But what happens when children devise and create video games for themselves? That would demonstrate not only imagination, but also resourcefulness and follow-through–a marriage of just what we say we want from education. With the Hopscotch iPad app, created by Samantha John and her co-founder Jocelyn Leavitt, kids learn about programming with by designing and writing code for their own animations and games. The app is divided into two parts: an editor that uses a simple visual language, where users can create their program, and a stage where they can see their program in action. My guess is that students find it more fun to write these games than to play them, just as they probably find it more to write their own books than it is to read the books they write. And that’s okay! What’s important here is the skills that are being developed and reinforced through the development of new content / new interactive experiences. A great chef may enjoy the process of cooking a sumptuous meal more than he or she would ever enjoy sitting down to eat it. Do we therefore doubt the chef’s skill? On the contrary, most of us would take that preference as confirmation of the chef’s expertise. Anybody can eat. Not everyone can cook. BoomWriter is a fantastic site that teachers and students alike will love using. Teachers will love it because it’s free, easy to use, and engages students to optimize their learning. Students will love the kid-friendly look and feel of BoomWriter, as well as using technology to create and share stories with classmates. Check out the full review. David gives BoomWriter a more thorough treatment than we have been able to provide here, and provides excellent insight on why it is becoming a favorite for students and teachers alike. Yesterday’s piece provided a quick look at QuadBlogging, the 100 Word Challenge, and other collaborative writing projects that classes can undertake together. I made a couple of suggestions of my own, both leveraging the BoomWriter platform, which involved classes Quad-Authoring an entire book or taking turns writing and selecting the next chapter for each other. Here we see a fairly small class — just seven students. Each student writes a first chapter of the book, which picks up where the story start left off. The students then review each other’s work and vote to select a winning Chapter 1 to be the official continuation of the story. Building from the winning chapter, each student then writes a second chapter. The students then repeat the review and voting process, and the book continues until it reaches a conclusion. 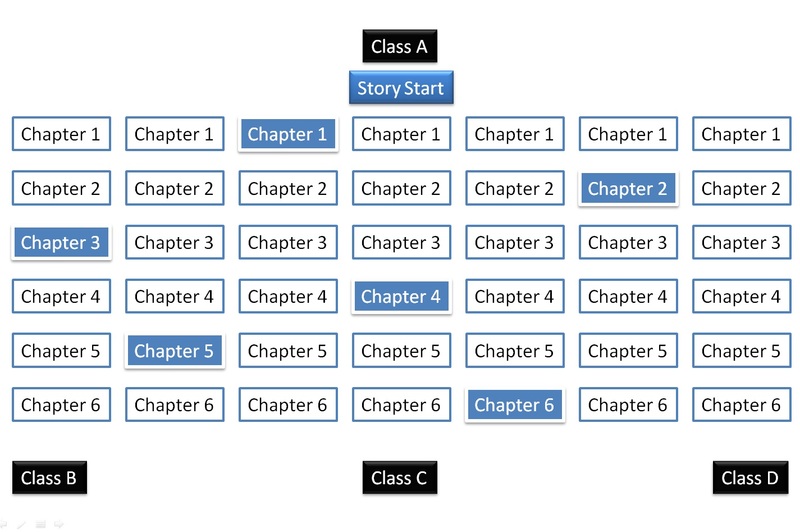 The QuadBlogging (or QuadAuthoring) model would work exactly the same way, except you would now have three additional classes participating as reviewers and selectors of the winning chapters. Each class would have a turn at writing the book, so in the end you would have four books — each written by members of one class with chapter review and selection performed by the other three classes. Next we have the back-and-forth model, which would allow classes to truly collaborate. Each time a class begins a new chapter they would use as their starting point the previous chapter authored by the other class. 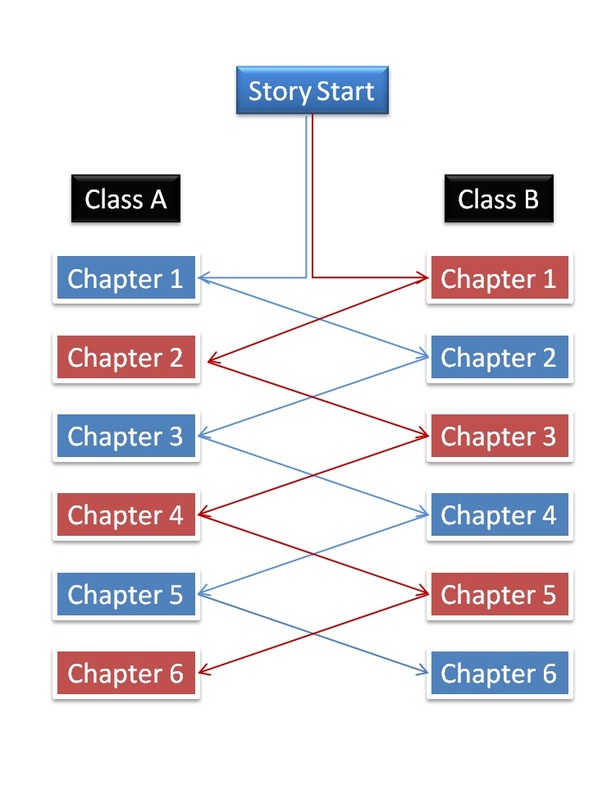 In the end you would have two books–two versions of the same story–both collaboratively written between the two classes. 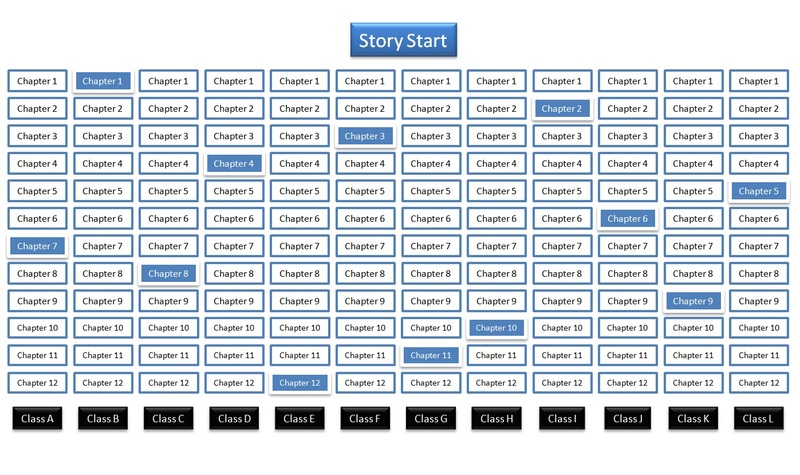 Or you could combine this idea with QuadAuthoring and let another two or three classes select between the two finished books. But I think there’s something appealing about the idea of writing two books together. Both classes would be equally invested in both versions — having contributed as much to one as to the other. Now let’s really have some fun. Now imagine a book that’s all about the hand-offs. We’ll give this one a working title: The Day 100 Amazing Things Happened. Reach of the authorship — who got invited to join / how diverse was the collaborative group? The Day 100 Amazing Things Happened would probably need to be a high school project, but could easily be scaled down to a middle school project (with 25 amazing things happening) or even primary (with a dozen amazing things happening.) Once the handoffs started it would be truly fun and exciting for everyone involved to see see how things unfold.